Leave a comment on THIS post by 6 p.m. CT Tuesday, September 15, 2015 to be entered in the DRAWING for an eBook copy of the book below. This week I’m interviewing author, Jo Huddleston, who writes sweet southern romance. Pull up a chair, grab a cup of tea or coffee and let’s talk to Jo. Jo Huddleston is a multi-published author of books, articles, and short stories. Novels in her West Virginia Mountains Series and her Caney Creek Series are sweet Southern romances. Jo is a member of ACFW, the Literary Hall of Fame at Lincoln Memorial University (TN), and holds a M.Ed. degree from Mississippi State University. Learn more at www.johuddleston.com where you can sign up for Jo’s mailing list, connect with her on social media, and read her blogs. Welcome, Jo. Let’s get better acquainted. I’m claustrophobic, a light stays turned on in my house 24/7, and I never could do a cartwheel or jump rope. The beach, any beach. But my favorite beaches are those on the Florida coastline on the Gulf of Mexico. Maybe this is true of any vacation spot, but at the beach I feel relaxed and the lifestyle is slower. I find enjoyment just watching the waves come in, recede, and crash again onto the sand. And I love the sunrises and sunsets on the water’s horizon. Please tell us a little about your novel, Trust Me. Loreen Fletcher has suffered heartbreak. She resolves never to trust a man again. She has earned a respected position with no help from anyone, especially not from a man. At thirty-six, she knows loving brings inevitable misery, and she won’t pick at that scab again. Please tell your friends and family about the book. Posting a short review of the book on Amazon is much appreciated! Also, spread the word on your social media outlets like Facebook and include this link to the book: http://tiny.cc/4yph1x. Vickie, thanks for having me visit with your readers and you. 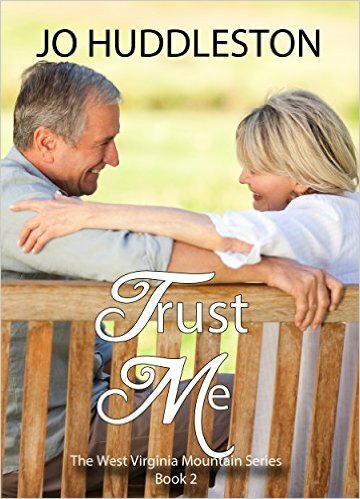 I’m offering a Kindle eBook copy of Trust Me to one person, the winner drawn from commenters to this post. Thanks for being with us today, Jo. The best to you and your writing. Always looking for sweet Christian romance books,if yours are,would love to read it! Carrell, yes, my books are sweet Christian romance books. If you get to read my books, hope you enjoy them. Thanks for commenting. Norma Jean, good to see you here on Vickie’s blog! PIW is where it all started for me, and where Vickie and I met. Yay for the beach. Thanks for commenting. Enjoyed the interview with Jo. I am a big fan of her books. Please do not include me in the drawing as I just finished reading Tidewater Summer and I loved it.